As technology advances, paralegals get more and more in tune with software which can assist us, personally and professionally. Paralegals are consistently looking for ways to streamline our organizational structure with technology, from word processing to trial presentation software. As technology advances, society continually looks for the smaller, more portable, most functional option. After using an iPad for over six months, I can attest that it is a wonderful legal tool. There is seldom a day I do not use the iPad. The iPad is fairly expensive, starting at $499.00 for the 16 GB Wi-Fi models, accelerating in price to $829.00 for the 64 GB Wi-Fi plus 3G. The 3G models allow you to have service wherever AT&T has service; however, in order to get the 3G service, you must purchase a data plan from AT&T. My iPad is the 32 GB Wi-Fi model. It is not designed to replace a full computer; however, it is a wonderful supplement as it allows me to write articles and blog on the road, as well as providing a number of legal tools. The iPad has a wonderful battery life and, when in a Wi-Fi area, allows me to browse the internet or conduct a little free legal research, using Fastcase, a free legal research tool for iPad. There are a number of other legal applications which are helpful. The ABA Journal is a free application that provides breaking legal news. LawBox provides access to the Federal Rules of Civil Procedure, Federal Rules of Criminal Procedure, Federal Rules of Evidence, the Constitution of the United States, and U.S. Code Title 28. LawStack provides access to the U.S. Constitution, Federal Rules of Appellate Procedure, Federal Rules of Bankruptcy Procedure, Federal Rules of Civil Procedure, Federal Rules of Criminal Procedure, and the Federal Rules of Evidence. Pocket Justice provides access to Supreme Court decisions, oral arguments, and opinion announcements. Additionally, there are iPad applications for different state statutes. I have Nebraska and Iowa on my iPad (approximately $5.00 each), as well as the Title 3 Code of Federal Regulations and the U.S. Code. NOLO offers a free Law Dictionary for iPad. LegalPad H.D. 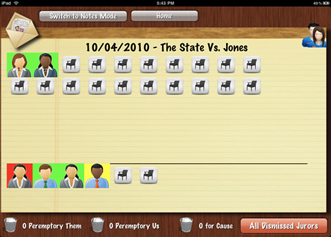 is a legal pad that allows you to take notes using your finger or a specially-designed iPad pen. Court Days is a date calculator which allows you to quickly calculate the number of court days or calendar days before or after a given date. The program will allow you to calculate multiple dates on a single screen. iCLE, a derivative of iJuror, allows you to keep track of your Continuing Legal Education hours. Nebraska Court Calendar is an application developed through the Nebraska Judicial Branch which allows you to access court calendars at any time of the day or night. This is very useful if you wish to check the Court’s calendar or the calendar for a specific judge. Trial paralegals can get a lot of use out of the Jury Tracker, iJuror (screenshot above), Transcription Reader, and TrialPad. iJuror allows you to track details about your jury selection, while Jury Tracker takes it one step further and allows you to set a timer to track time used by each party. This is very useful for opening and closing arguments. It also allows you to keep track of juror activity such as note taking, eye contact, body language, fidgeting, or even whether your juror is paying attention or not. This is very useful when polling a juror after the verdict has been entered. Jury Tracker is a relatively new program but allows much more versatility than iJuror. Mobile Transcript allows you to have the court reporter send the transcript to Mobile Transcript for download. You can then highlight the deposition or start the timer and calculate the time it takes to review the deposition or index or summarize your deposition for billing purposes. MyWorkTime is a task, time, and billing tracker that allows you to keep track of the time spent on tasks or clients. The program is affordable at $2.99. The iPad calendar program also works very well with Outlook by synchronizing through iTunes. The newest program I have is TrialPad, which was just released in December of 2010. This program allows you to create different folders for each trial and store a portable data format (pdf) file for presentation at trial. This is a new program with no reviews and is the most expensive program I have at $89.00. The program connects directly from your iPad to the standard projection software available in Sarpy County and Lancaster County Courtrooms, and hopefully in the future the remaining Nebraska counties, enabling you to review, annotate, and scroll through your documents in front of the jury. It is a great tool if you are tech-savvy in the courtroom. A more active and daily useful option is iAnnotate PDF, which allows you to annotate your pdf with notes, highlights, and bookmarks, which can be added or removed at will. This is a very good program at $9.99, and very helpful for preparing for depositions or client meetings. There are a number of other programs I use frequently, such as Index Card and iCardSort, which have been very useful for brainstorming on cases and organizing facts. Medscape is useful for checking drug interactions or looking up medical procedures I am not familiar with. DocstoGo is a great program to transfer Word, Excel, and PowerPoint documents from your land computer to your iPad, at a very affordable price of approximately $15.00. Finally, iMeeting Pad is a very useful program for meetings and is fairly self-explanatory. The program allows you to take notes at meetings, which you can later organize into meeting minutes and e-mail to meeting attendees. The program has an option allowing you to Tweet from Twitter, for convenient “meeting tweeting.” This is useful if all of your meeting attendees are on your Twitter list and you want to tweet a new meeting date and time. This, of course, leaves issues of confidentiality, as well. The iPad comes with a built-in keyboard which is very easy to use; however, I have found that with the amount of time I spend on my iPad that purchasing an external keyboard is helpful. The keyboard connects through Bluetooth and makes work on the iPad as convenient as working on a netbook or laptop. 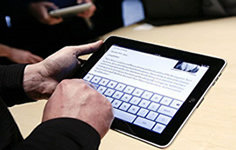 Overall, the iPad has become a very useful legal tool for both attorneys and paralegals. Christi Koch received her Paralegal degree in 1991. She is a trial paralegal, specializing in personal injury litigation. She also holds a Bachelor of Science degree in Management and is a National Dean’s List Scholar. Christi is an Advanced Certified Paralegal in Trial Practice and joined the firm of Inserra & Kelley in 2002. She is a member of the National Association of Legal Assistants, the Nebraska Association of Legal Assistants, and a paralegal affiliate of the American Association for Justice (formerly the Association of Trial Lawyers of America). She is originally from Orchard, Nebraska, and has been working in the legal field for over 19 years.